President “Bobby” (Jack Warden): Life is a state of mind. And in my mind, I am remembering days when words had meaning, when fact was easily discernible from fiction. I am feeling nostalgic for a time before absolute truth became absolutely pliable. I am thinking about the farce of reality TV. I am remembering what election cycles were like before the days when a candidate’s staff could actually unabashedly declare that they would not allow their campaign to be run by fact-checkers. As for the specific time and place, I am finding it difficult to pinpoint when everything changed, when it was exactly that we became brazen enough to scoff at scientists regarding something as consequential as climate change or disregard the theories of leading economists regarding how to best dig out from a recession. Nowadays, not only are opinions a dime a dozen—everyone has them—but they are given equal weight no matter the author. President “Bobby”: Mr. Gardener, do you agree with Ben? Or do you think we can stimulate growth through temporary ascends? Chance the Gardener (Peter Sellers): As long as the roots are not severed, all is well, and all will be well, in the garden. President “Bobby”: In the garden? Chance the Gardener: Yes. In a garden, growth has its season. First comes Spring and Summer, but then we have Fall and Winter. And then we get Spring and Summer again. President “Bobby”: Spring and Summer? President “Bobby”: Fall and Winter. 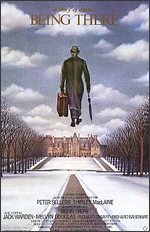 I recently watched Hal Ashby’s Being There and was struck by how its satire feels disturbing if not prophetic in the context of a present that grants implicit, free and easy access to authority on any topic whatsoever. All we have to do is turn on a television or read newspapers, magazines (rags suffice) or even blogs of other self-appointed experts. Louise (Ruth Attaway): It’s for sure a white man’s world in America. Look here: I raised that boy since he was the size of a pissant. And I’ll say right now, he never learned to read and write. No, sir. Had no brains at all. Was stuffed with rice pudding between th’ ears. Shortchanged by the Lord, and dumb as a jackass. Look at him now! Yes, sir, all you’ve gotta be is white in America, to get whatever you want. So how did we get here? I have a theory. Let us call it my own expert testimony. In my opening remarks, I offer that somewhere, somehow, it became far less important what we say than how (and where) we say it. Morton Hull (Arthur Rosenberg): Do you realize that more people will be watching you tonight, than all those who have seen theater plays in the last forty years? From my channel-surfing calculations, I conclude that all hell broke loose sometime around the onset of the EDD plague. A raise of the hands: Who hasn’t been afflicted with some form of Electronic Device Disorder? This is not to suggest I am not a huge fan of iPads, iPhones, and all the rest, because in fact iLike them very much, it is just that, as a self-proclaimed expert witness, it is my strong recommendation that we must find a way to scale it all back, like when you are out on the town at dinner, wanting to enjoy the ambience of a restaurant and the company you are with, and suddenly EDD strikes and the companion sitting across from you is squinting into a phone screen in order to read or reply, answer a call, look up a picture, take a picture, re-take a picture, or any number of other side effects brought on by the plague. President “Bobby”: Oh? Really? Well, Mr. Gardner, I’m a man who appreciates discussing a frank discussion. Would you be seated? Chance the Gardener: Yes, I will. Let us take a moment to consider one of life’s grandest themes: nature versus nurture. Benjamin Rand (Melvyn Douglas): Oh, Chauncey, you have the gift of being natural. That’s a great talent, my boy. It is funny that Chance is praised for being natural when in fact his social behavior is entirely nurtured and hardly the least bit natural at all. He is a mimic, having learned how to interact with others by merely watching television. Then again, who in this world is not a product of what they have been taught, be it from television, newspapers, magazines, family, friends, co-workers, spiritual leaders, and on and on? Ben: You seem to be an exception, Chauncey. That’s one of the things I admire about you, your admirable balance. You seem to be a truly peaceful man. Chance the Gardener: Thank you, Ben. Thank you. While everyone believes Chance-turned-Chauncey is a brilliant mind, someone who is consciously and meditatively employing gardening metaphors as elegant templates to solve the most complex economic problems facing a nation and even the world, the reality is that everybody is simply choosing to hear what they want to hear. We choose to support our own learned beliefs by gravitating toward ideas that we believe best validate or align with those beliefs, thereby closing ourselves off to possible avenues of enlightenment. I think this is why change, particularly change in Washington, is so difficult to achieve. Both sides of the aisle remain firmly entrenched in their own ideology, leaving fewer and fewer opportunities to walk the plank towards compromise or even worthwhile debate. We remain locked in a vicious cycle, circling solutions along tried and true trodden trails of partisan gridlock that helped get us here to begin with, all the while digging us in deeper and deeper into the sanctuaries of our own stubborn and blissful ignorance. President “Bobby”: I have no use for those on welfare. No patience whatsoever. But if I am to be honest with myself, I must admit that they have no use for me either. I do not regret having political differences with men that I respect. I do regret however, that our philosophies kept us apart.